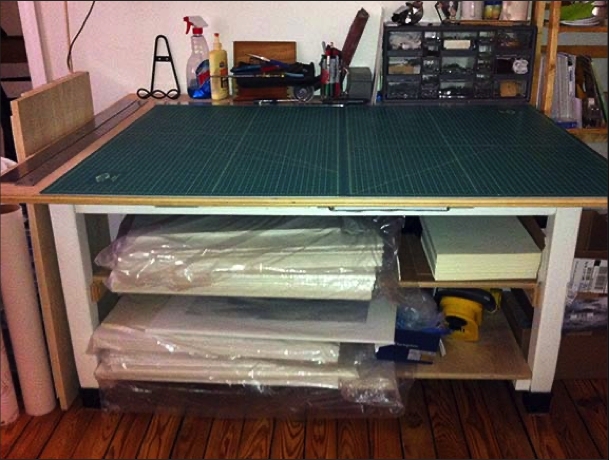 Many artists have a need for a large, strong studio surface for cutting mats, framing, dealing with glass, etc. Suitable tables can be quite expensive (almost laughably so). This is a very easy, very inexpensive solution to the problem. I’ll describe the one I made for myself. A little paint underneath (the table bottom was in bad shape and needed a lot of bubble gum removed), a cleanly waxed top, and I had myself a great, practical studio work table. Covering most of the top is two 24x36 inch self-healing cutting surfaces (available at Amazon). As you can see from the picture, this thing is large enough on top, stores enough underneath and gets heavy use. All for very little money and just a couple hours of work. The key is the sheet of hardwood plywood, check it out. Easy. Just get yourself down to Home Depot or some similar station and pick out a 4x8 ft. slab of hardwood plywood. I based my needs on rigging a table that will hold, and allow cutting, of a 32x40 sheet of rag – with all my tools, etc. lined up along the wall. That meant I had to allow for the 36” depth of my cutting surface and a few inches for my “stuff.” They will cut your wood down to size right there at the store – I had my top cut to 44x54 (wide enough to cover the table bottom and give me some side room). Voila – instant table top. Some light sanding along the edges, and all you have to do is paste-wax the surface. A number of years later, when we moved, I did apply another layer of wax. Literally almost anything. We had an old school lab table floating around. The unbelievably heavy top was held on by screws from underneath. I removed the top (tossed it) and simply screwed my new top onto the base from under – pretty much centering it. Alternative bases can easily be used – and one can always just leave the top on, and center the new expanded top over it. One could even use two smaller, matching tables. When I bought the top, there was enough left over from the 4x8 foot slab of hardwood plywood to have a shelf cut for mounting underneath (I added a second shelf when we moved). All I needed was a couple of screwed-on supports cut from scraps from the same sheet of plywood. If where you get the large pieces cut they don’t want to do this, just take the scraps to someone with a saw (like me) and ask them to do it. Too easy and quick to turn anyone down.